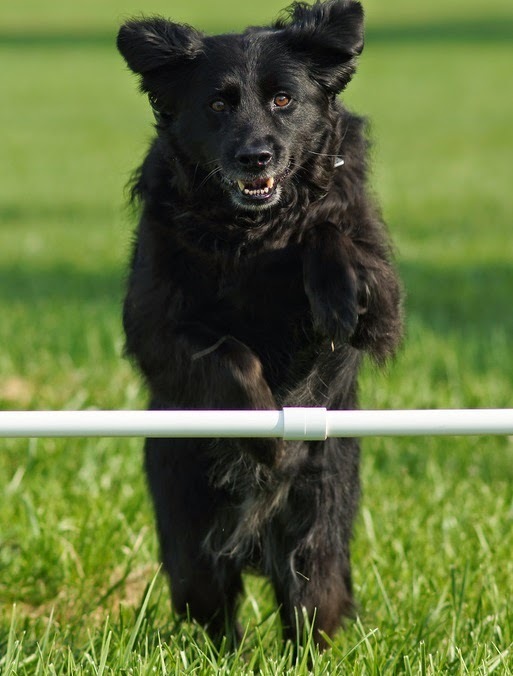 When I started agility, I went in with absolutely no idea what to expect out of myself or my dog. I stepped into class with a dog who was mellow and sweet and had a brilliant stay. A seriously brilliant stay. As in, I could walk a few hundred yards and she wouldn’t move a muscle. Of course, that translated to a dog who was sure that her goal in front of a jump was to stay and keep staying, no matter what I did. Proofing? We had it. We really had it. What I didn’t have was an ace agility dog. Or even a dog with a lot of energy. It’s been four years since I started agility with that dog and I’ve had a lot of time to think about what I want to do with her in agility. Get a C-ATCH? Never. A MACH? Ha. That’s a good one. After only going to one trial in the past year (one that was an unmitigated disaster, though she did have a really awesome stay! ), I finally came to a conclusion: It’s not titles or ribbons. It’s not even trials. I’m not sure if we’ll ever go back to a trial at this point and if we do, it won’t be with the goal of getting big qualifying scores and titles. That’s for a lot of people. Most people in agility, I would wager. But it sure isn’t for me and my girl. Success is fairly easy to define if you’re going to trials. Oh, it will be different for everyone. But there are certain measures of success. The big measures of success are the Q’s, the ribbons, the titles you can attach to your dog’s name. There are the smaller ones of course, the sorts of performance goals like hitting a solid 2on/2off on the A-Frame or being able to lead out past the second jump or getting that darned tunnel/dog walk discrimination that’s been tripping you up. Those used to be my goals, my measures of success. I still remember the thrill of the first time my dog took the A-Frame at a trial, the first time she did the teeter. She didn’t Q either time because something else went wrong, but I remember feeling that as a team we had been successful because we met those goals. But that was then. This is now. And how do you define success when you’re not working toward the goal of getting a Q or a title? What is considered successful when you’re only going to classes? At this point, I have really one measure of success for our classes. One and one only. Ready for my big measure of success? My big goal? Did my dog have fun? That’s it. That’s the measure of success for me. Did she look happy? Was she excited? Did she enjoy playing the game with me? Did she pounce on the ball o’ treats (aka Clean Run’s Lotus Ball) with great glee? If she didn’t have fun, then why not? What can I do to change that? We certainly went through a time where every class seemed like a chore, where she was obviously not having fun. So I found I had to reward her more, had to get her more excited, had to relax and be more playful with her. It really is that simple for me. If we walk out of class and we had fun together, it was successful. Maybe we weren't perfect (ok so we likely weren't), but that's not important. It really is all about having fun together and as long as we do, that's all that really matters. This was written as part of the Dog Agility Blogger's Action Day's "success" theme. Please check out all the other amazing posts here. You sound like you are successful to me. WTG! Much thanks Steve! We're always working on being successful and don't always succeed. Sometimes classes are rough and we don't have that much fun. But that just means it's time to reevaluate why and work on making it fun again. Agility really has brought out the best in Dahlia. She had such a lack of confidence and had been clearly so controlled in her previous life that it took a long time for her to just let loose and learn she CAN have fun! Thank you for sharing your success goal. You are so right. My dog Fudge just turned 10. We've had a lot of fun out there in class and at trials. But I think now, in his "golden years" my focus should be on him having fun. We have another title we could shoot for, but in the end, when I look back, I want to remember him just having a great time. Thanks again! Very good - I haven't trialled in over a year (busy building a house and a new life) but agility is as big a part of my life as I can make it. I don't have local classes even but we still have success (by our definition) at agility!